Abstract: The authors summarized and analyzed the theoretical exploration of US health and physical education teacher cultivation and the practical experience of some university health education curricula, hoping to provide ref-erence for Chinese health and physical education teacher cultivation. 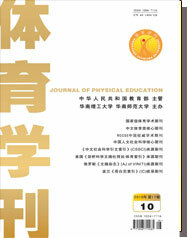 The authors pointed out that the public’s health demand triggered US society’s thinking about the roles and responsibilities of physical education workers: 1) physical education teachers should be provided with the characters and attainments for engaging in the health edu-cation job; 2) physical education teachers should be provided with specialized knowledge for being qualified for health education teaching; 3) physical education teachers should be provided with comprehensive abilities to par-ticipate in health education practice; 4) physical education teachers should become the leaders of health education. With the constant progressing of theoretical research, Arizona State University, Adelphi University and University of Utah in the US had done health education curriculum practice and made certain achievements, which give health education teacher cultivation in China the following inspirations: 1) based on public health service as orientation, cultivate trans-disciplinary health education workers provided with service awareness and abilities; 2) based on health knowledge and abilities as important evaluation standards, supervise and examine physical education teach-ers’ health attainments; 3) based on elementary and middle schools, communities and related health medical organi-zations as cooperation partners, deepen universities’ communication and cooperation with these subjects.